Muckross House is a magnificent Victorian mansion located in the Killarney National Park and is one of Ireland's leading stately homes, it is a focal point within the Park and is the ideal base from which to explore its terrain. 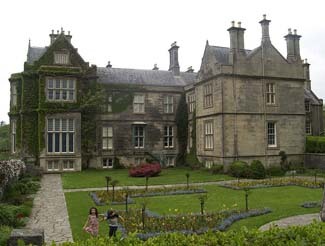 Muckross House was built in the Tudor style and comprises of 65 rooms. Extensive improvements were undertaken in the 1850s in preparation for the visit of Queen Victoria in 1861. Today the principal rooms are furnished in period style and portray the elegant lifestyle of the 19th century landowning class. While in the basement, one can imagine the busy bustle of the servants as they went about their daily chores. The Gardens at Muckross House are particularly noted for their fine collections of azaleas and rhododendrons, an extensive water garden, and an outstanding rock garden hewn out of natural limestone. Muckross House is also home to a number of skilled craft workers who can be viewed using traditional skills in the crafts of weaving, bookbinding and pottery in the adjacent walled garden centre. You can also visit three separate working farms from the 1930s and 1940s - a period before the widespread use of electricity, when all work was carried out using traditional methods - each complete with animals, poultry and horse drawn farm machinery. You will also visit a labourer's cottage, a carpenter's workshop, a harness maker and a blacksmith's forge. Muckross House & Gardens: Adults €7; Child/Student €3; OAPs/Group €5.50; Family €17.50. Muckross Traditional Farm: Adults €7.50; Child/Student €4; OAPs/Group €6; Family €22. JOINT TICKET for House, Garden & Farm: Adults €12; Child/Student €6; OAPs/Group €10; Family €32. 6.5km from Killarney on N71 (Kenmare Road).